Although most drivers are accustomed to sharing the road with commercial trucks, it can still be nerve wracking to drive near them. This is because it is difficult to avoid getting into an accident with one when the truck driver makes a mistake. There are three common types of truck accidents that happen: jackknifing, rollover, and blind spot accidents. Speeding: Driving too fast results in this type of accident because it takes longer for semi trucks to slow down and they are harder to control. Bad weather: Wet or icy roads can cause slippery conditions that make it difficult for tires to get traction. When dry areas receive even small amounts of rain, oil buildup can create even more unstable conditions. Inexperienced drivers: Trucking companies sometimes hire untrained drivers to save money or because they are in need of employees. This can increase the chances of jackknifing accidents. Unbalanced loads: Making sure that cargo is secure and balanced can help prevent jackknifing accidents caused by shifting loads. Fatigued drivers: Truckers who have been driving for too long are more likely than well-rested drivers to be in an accident. Longer commercial trucks are more likely to jackknife because they pick up more momentum. Lighter trucks are also more likely to be involved in a jackknifing accident. It can be difficult to tell when a truck driver will make a sudden movement on the road that could result in jackknifing. This is why it is best to stay away from trucks and avoid cutting them off. These accidents can be some of the most dangerous, especially if hazardous materials are involved. Most rollover truck accidents are caused by an unbalanced load, typically liquids which move around unpredictably. The following are some other typical causes of rollover accidents. Mechanical issues: Many times, truck accidents are caused by mechanical problems like faulty brake systems. Size of the cargo: The size of the load a commercial truck is carrying can also contribute to a rollover. For larger loads, whether solid or liquid, it is vital to ensure that nothing will shift and cause a rollover. Driver error: In many wrecks, not just commercial truck accidents, the driver is to blame. Every trucker should understand the vehicle and types of loads they are working with to avoid mistakes and dangerous accidents. Every vehicle has a blindspot, but this area is larger for semi trucks. In fact, the blind spot is actually so big that it is known as “No Man’s Land.” Although most people do not know exactly where a trucker’s blind spot is, there are some things you can do to avoid driving in it. There is one blind spot directly behind commercial trucks and one in front of them. These take up both the truck’s lane and the side lanes as well. There are also blind spots to the left and right of the trailer that extend out into many lanes. These blind spots can vary slightly depending upon the semi truck, so it is best to be as safe as possible when driving around them. First, give commercial trucks plenty of room around all sides. You should avoid passing them too quickly or jumping in front of them as well. Never drive too close to the back of a semi either, because the trucker cannot see you and you cannot see around him or her. Being patient when driving near commercial vehicles is one of the best ways to avoid accidents. Understanding that they have more vehicle to maneuver is also important. When they are turning right, do not drive on their right side because they need more room than passenger vehicles. When passing, signal early, drive with care, and do not take too long. If you are in a truck accident, it is important to take care of your medical needs first. If the trucker was at fault for the wreck, you may be able to seek compensation. Be sure that you are well enough to file a claim before you speak to their insurance company and consider hiring an attorney to help. 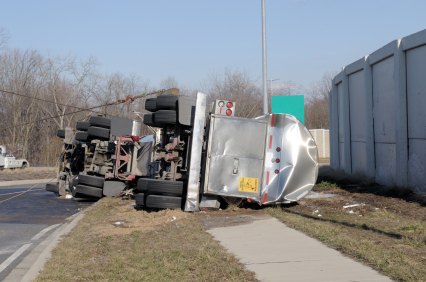 They are experienced in these types of claims and understand how truck accidents happen. Truck Accidents can be devastating and stressful, especially if you are seriously injured. Attorney Dean Boyd and his caring team can help you during this difficult time. Call us 24/7 at (806) 242-3333 or Contact Us by email to learn more about our Services. You can also visit us in person at 4423 SW 45th Avenue in Amarillo, Texas or 5012 50th Street #103 in Lubbock, Texas.